Bitbucket Server administrators can set up SSH access keys to secure the Git operations that other systems perform on the repositories managed in Bitbucket Server. 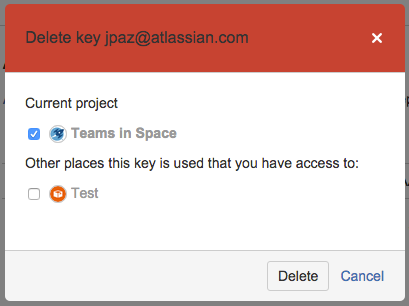 Using access keys avoids the need to store user credentials on another system, and means that the other system doesn't have to use a specific user account in Bitbucket Server. For example, access keys can be used to allow your build and deploy server to authenticate with Bitbucket Server to check out and test source code. 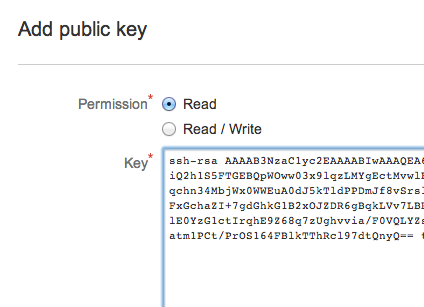 Project admins can add and manage SSH access keys for a project. The keys apply to every repository in the project. Repository admins can add and manage SSH access keys for a particular repository. The access key can allow either read-only or read-write Git operations. Because they are designed to be used for system access, SSH access keys may push commits that are not signed with a GPG key even if the "Verify Commit Signature" hook is enabled. Note that Bitbucket Server supports DSA and RSA2 key types – RSA1 is not supported. Your Bitbucket Server administrator must have already enabled SSH access, on Bitbucket Server. You must have already created an SSL key. See Creating SSH keys. Alternatively, you can use an existing key, if it isn't already being used for a personal account in Bitbucket Server. Add the private key to that system. For Bamboo, see this page: Shared credentials. You simply copy the public key, from the system for which you want to allow access, and paste it into Bitbucket Server. Now, in Bitbucket Server, go to the Settings tab for the project or repository. Click Access keys and then Add key. Choose the Read permission, for git pull or git clone operations for example, where you want to be sure that the system will not be able to write back to the Bitbucket Server repository. Choose the Read / Write permission, for git push or git merge operations for example, where you may want your build system to merge successful feature branch builds to the default branch in the Bitbucket Server repository, or so that deployments can be tagged. Note that if you attempt to add a key already present on a project or repository but with a different permission to what it currently has, the permission will simply be updated. Paste the key into the text box and click Add key. System access keys do not require an additional Bitbucket Server user license. Keys used for personal user accounts can't be re-used as a project or repository system access key, and keys used as a project or repository access key can't be re-used for user accounts. Note that the dialog only displays the projects and repositories that you have permission to see. Be aware that the key may also be used in other places that are not listed in the dialog. To be 100% sure that all uses of the key are deleted, this operation must be performed by someone with the administrator or sysadmin global permission.